Getting ready for your next camping trip? Listen up! Whether you’re a seasoned camper or a first-timer, here are 12 essential camping tips that you need for your next trip away in a tent. 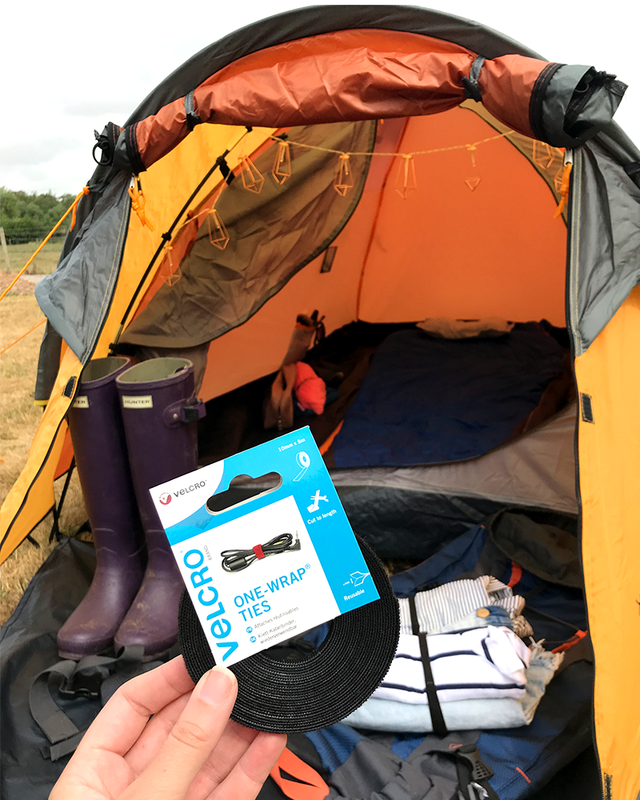 From what to pack to clever camping hacks, you’ll be surprised how handy VELCRO® Brand fasteners can be on a camping holiday! A two-man tent may sound big enough for two people but once you’ve filled it with all your camping gear, it might start feeling a bit cramped! We’d recommend taking a slightly bigger tent than you need – especially if you’re planning on taking an airbed, which can take up a fair bit of room on its own. Packing for a camping trip can be a challenge in itself – and your tent and sleeping bag will probably be the bulkiest things you need to take with you. So for easy packing (and carrying), we’d recommend wrapping them up with a VELCRO® Brand Stretch Strap like this. 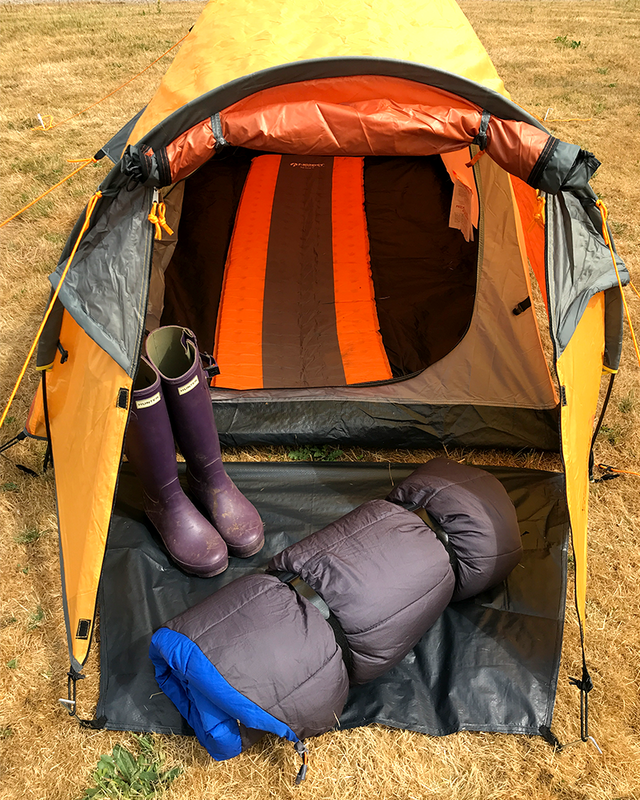 It’s ideal for turning your tent or sleeping bag into a smaller load to carry – and it’s MUCH easier than trying to stuff them back into the tiny bags they come with. Camping is about getting away from it all… But the reality is, you probably won’t want to be without your phone (especially if you’re relying on it to take photos of the beautiful scenery). 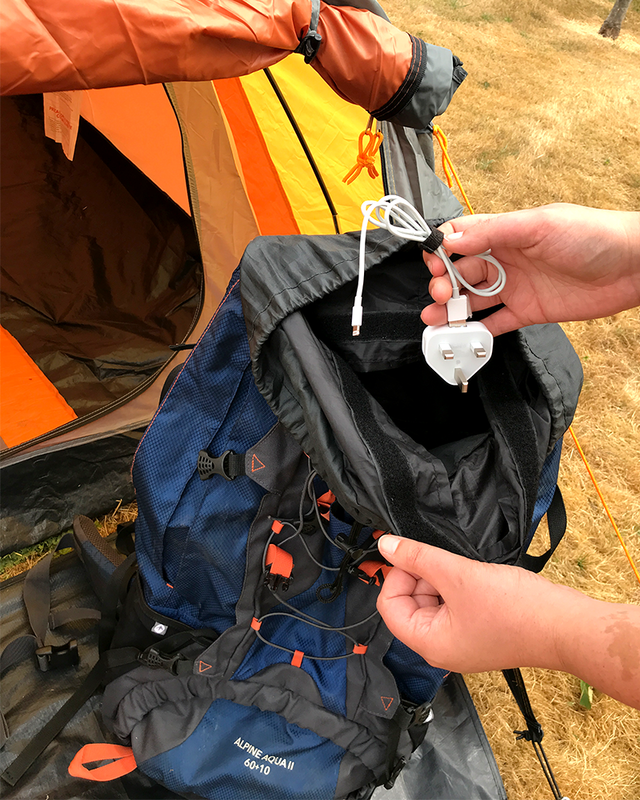 With that in mind, make sure you pack a portable phone charger as plug sockets are few and far between on a campsite! Chances are your rucksack will be packed with a million and one things, which is a recipe for things to get messy! So to avoid the inevitable tangled wires when you pack phone chargers and headphones, wrap them up with these VELCRO® Brand ONE-WRAP® ties. Britain is notorious for having all seasons in one day so even if the weather forecast says glorious sunshine, make sure you’re prepared for all weather conditions! Don’t leave home without layers and waterproofs to prepare for sudden cold spells/rain showers. And make sure you pack shorts, sunglasses and sun cream in case of sunshine! The demand for camping supplies skyrockets in spring and summer so it’s no wonder that the price of tents and camping gear skyrockets too. Top tip: Save yourself money by buying these things out of season when less people are going camping and they’re on sale. 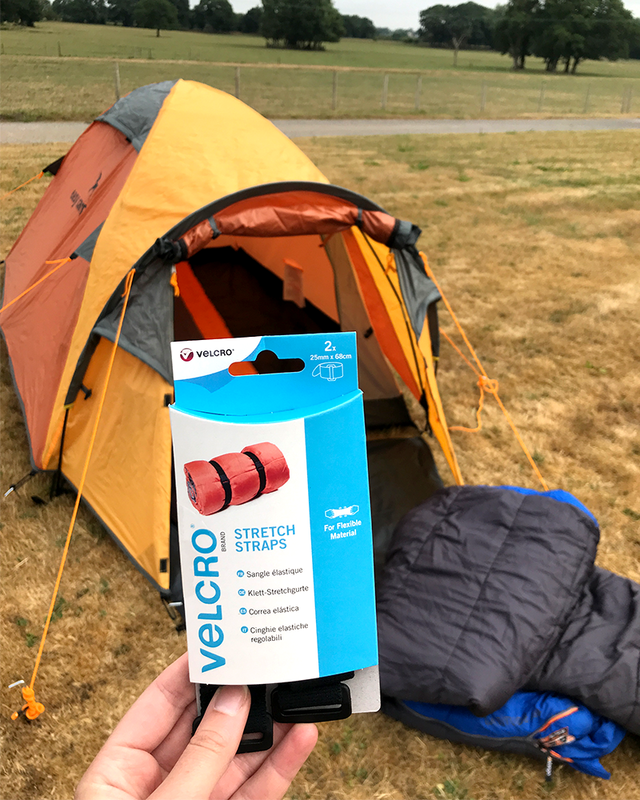 There’s nothing wrong with a roll mat but if you want your camping trip to be a little comfier, our top camping tip would be take an airbed! Just bear in mind that it will take up quite a lot of room in a two-man tent so follow our first tip and take a slightly bigger tent than you need. If you are taking a roll mat and you’ve been camping before, you’ll know how annoying it can be when it won’t stay in one place. Simple solution: Stick it to the ground mat with VELCRO® Brand Stick On for Fabrics! One of the best parts of a camping trip is sitting round the fire at night and since sitting on the ground is not the comfiest, our top tip is to bring enough camping chairs for everyone. And to make them easier to carry, you could wrap them up with a VELCRO® Brand Stretch Strap. Firewood for your campfire can be rather bulky to carry, so make it easy by wrapping it up with a VELCRO® Brand Carry Strap. It gets pretty dark on a campsite when the sun goes down so don’t forget to bring some lighting! It goes without saying that a head torch will come in super handy and garden solar lights (the kind that stick in the ground) are great for lighting up your camping pitch. 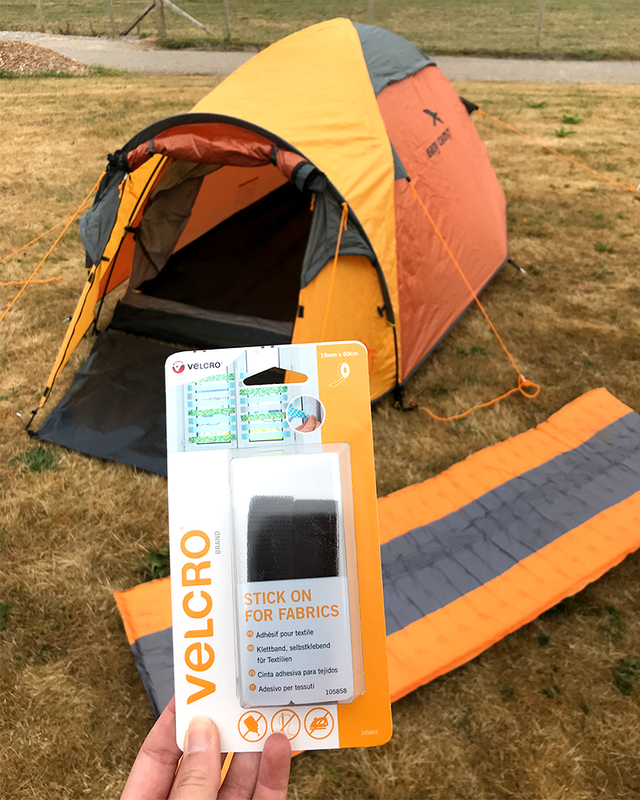 You could also create atmospheric lighting by sticking fairy lights to the outside of your tent with VELCRO® Brand Stick On for Fabrics! Last but not least, our final piece of camping advice is don’t forget marshmallows! Toast them on the campfire for the ultimate camping snack! Now you’ve got all our top camping tips, you’re all set for your next camping trip! If you’re interested in more clever ways to use VELCRO® Brand products, stay on our blog or check out our Instagram profile!